Kumaon & Garhwal - Travel to Kumaon & Garhwal in Himalayas region which is full of amazing sights, blessed with all the natural bounties, surrounded by towering peaks, trekking and hiking trails, a popular honeymoon destination and known for its immense natural beauty all over the world. majestic snow-clad peaks, enchanting lakes and a rich plethora of flora and fauna, is described as the "Abode of Gods". quite naturally then, the blissful air of divinity and postcard- picture beauty that envelopes the himalayas lends it a touch of paradise. Garhwal comprising the six districts of Dehradun, Uttarkashi, Chamoli, Rudraprayag, Pauri & Tehri, is a storehouse of anitquity a mecca for the devout and a heaven for adventure sports like river rafting, aero sports & skiing. Making it an essential on the itinerary of adventure lovers, pleasure seekers and pilgrims alike. The sacred place of Badrinath , Kedarnath, Gangotri & Yamunotri are located here and so are the sources of the most venerated rivers Ganga & Yamuna. The legendary valleys of Garhwal abound with natural beauty & also offer a distinct style of hill temple architecture and delighful handicrafts. So come to garhwal and join the cultural fiesta. Popularly known as the "Queen of Hills", this charming hill station, 34 kms from Dehradun is situated at an altitude of 2,003 mts above sea-level. Enchanting view of pine covered hill slopes and snow capped mountains leave an indelible impression on one's mind. 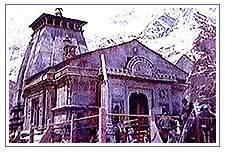 Panch Kedars are the five different forms of the Hindu God shivas, and are known as Kedarnath (3,584m); Madmasheshwar (3,289m); Tungnath (3,810m); Rudranath (2,286m); Kalpnath (2,134m). The trek starts from Gaurikund, where one can have a refreshing bath in the hot water sulphur springs. 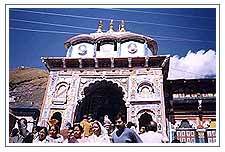 This trek is along the old pilgrim route from Gangotri to Kedarnath. This trek combines the experience of mountain climbing, rock climbing, boulder hopping and glacier traversing. The trek is not a very rigorous one and is easily negotiable by non mountaineers too. It passes through orchards of coniferous pine trees at chir basa and birch at bhojbasa. The panoramic Garhwal hills of Uttaranchal with its snow covered slopes are ideal for skiing in the winter months. The thrill of skiing over snow covered terrains remains unparalleled. As the elements are defeated and unimaginable distances traversed, exhilaration swells up. 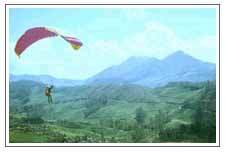 Garhwal makes para gliders paradise, with the Great Himalayas in North and the plains of Terai region in the south. This unique makes Garhwal an excellent destination for both experinced and beginners. Joy rides as well as trauining courses are also avaialabe for para gliding in Garhwal. While joy rides are ususally tandem flights, accompained by a trained flier, training are for those who are new to para gliding and sailing. In Garhwal, the sacred river ganga offers the professional as well as the amateur the exhilaration of white water rafting. The rivers Alakananda & Bhagirathi are the main tributaries of the Ganga and meet Devprayag, frothing from their racy descent. Their waters are grade IV to V, challenging the expert to survive the thrill. Down river from Devprayag, the ganga changes into a pool drop river. This stretch of almost 70-kms is a perfect for the amateur and the novice, for here the river offers some fine grade III rapids and two grade IV rapids, the 'WALL' at Bysi and the 'GOLF COURSE' 4 kms. Below Shivpuri village; each followed by deep and placid pools. Sandy beaches line the river at intervals, allowing river rafters to pull up alongside. The slopes on either side are covered with oak, pine, spruce and fir, with the occasional village and its terraced fields dotting the landscape. Wildlife can be sighted at a distance, especially spotted Deer, Monkeys, Leopard, while multi hued butterflies flit among flowering. It comprises the six north - eastern Himalayan districts of Almora, Bageshwar Champawat, Nainital, Pithoragarh and Udham Singh Nagar. To the east and the north the region touches the international boundaries of Nepal and Tibet. 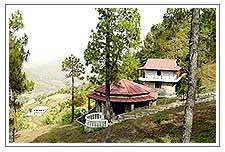 Nature has been at its bountiful in endowning Kumaon with exquisite tourist sites and scenic grandeur. Naini, a word that almost brings the cool air with it is a secret hide out of the tourists each year. Situated at an altitude of 1938 meters, this dreamland town with its beauteous splendour is one of the most popular tourist resorts of the country. The nucleus of naini tal's exquisite beauty is her lake which is a haven for water sports like yachting, kayaking, canoeing and boating. Situated on the confluence of two sacred rivers, Saryu and Gomti, Bageshwar is an important centre for Shiva worshippers. According to tradition Markendaya Muni lived here and Lord Shiva wandered in the form of a Tiger in this holy tract. The present 'Bagnath' temple located here was constructed by king Laxmi Chand in 1602 A.D. In close proximity is the old temple of Vaneshwar as well as the recently constructed Bhairav temple. Champawat (1,615m) offers a captivating view of the delightful wooded country and attracts also by its rich historic wealth. At one time it was the capital of the Chand Rajas of Kumaon. Under the crackling wheels of time, the ancient (11th to 12th century A.D.) shrines of Champawat have lost their main sanctum, but the remaining structure, the ancient temples of Baleshwar and Nagnath as well as the ruins around testify to this day the boundless creative energy of the hill artists. it is a newly formed district carved out from the erstwhile district of Naini Tal. It is named after the famous martyr Udham Singh. The life of a mountain is as intense and varied as a human being and to experience it one must move around it. In Kumaon mountaineering and trekking can be done in the regions from where the rivers Pindar, Gori, Dhauli and Kuti emerge. The peaks and passes near the glaciers of these rivers have been tempting the mountaineers and the trekkers one of the most enthralling experience is a trek to the glaciers of Kumaon.